888 Ladies Bingo | Get the Bingo App for FREE & Win! 888Ladies Bingo is a fun and fabulous online bingo site offering some of the best bingo games in the UK! The pink-themed brand is super feminine and appeals to all ladies who love bingo. The site is owned by 888.com has attracted a sizeable fan following. 888 Ladies Bingo is known for its fabulous new player offers, glamourous promotions, and fantastic bingo, slots, and casino games! When you first sign up to 888 Ladies Bingo and deposit your first £10, you can play with a fab £50 bonus for bingo and slots + 15 FREE Spins! Use code LADIESPIN to start playing your favourite games with your bonus cash! Lord Bingo believes that variety is the spice of life and 888 Ladies Bingo boasts a wide array of fabulous games! In addition to the traditional 90-ball bingo and 75-ball bingo, they also offer players the new Flash Fives bingo, 5 Line bingo, team bingo and jackpot bingo. When you throw in the thrilling progressive and guaranteed jackpot games, there’s enough to cater to every kind of player. Some of the top games available include Fluffy Favourites, Millionaire Genie and Shaman’s Dream. You can also find Cleopatra, Bejeweled, and many more top titles from the hottest gaming providers! You can head to the 888Ladies community to meet the other players in the glam Ladies Lounge. The lounge features contests and entertaining and interesting articles for the ladies that play on 888, as well as profiles of site members! 888Ladies Bingo is bursting with fun and caters for every kind of player, so take advantage of the sign up promotions and fun, entertaining community feel today! Continue the fun on the go! 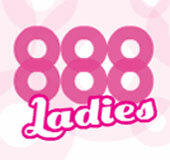 Simply play on the mobile site from any device or download the 888 Ladies app for iOS on your iPhone and iPad!